This vegan feta cheese is gluten free, dairy free, nut free, and super easy to make! It tastes surprisingly similar to feta made from dairy, yet since it’s made with tofu, it gives you added protein for a satisfying meal. Keep it in the fridge ready to crumble on top of salads or pasta! Did you love the taste of feta crumbled on your salad or pasta? You can have that taste again with this vegan feta cheese made from tofu and a few simple ingredients! How do I use this vegan feta? … or in a vegan beet salad! … Or try this vegan feta in these Addicting Feta Stuffed Grilled Tomatoes from Sustainable Cooks! How do I make homemade vegan feta? You won’t believe how easy it is to get great tasting vegan feta! First, simply press your tofu to get all of the excess liquid out of it. While the tofu is pressing, make a marinade by adding water, nutritional yeast, apple cider vinegar, lemon juice, miso, salt, and spices. I like to use a shallow container so all the liquid doesn’t just go to the bottom. Snapware make a great 6 cup sized one that has a snap on sealed lid that works great for this recipe! Then mix up your marinade and crumble your drained tofu into the mixture giving it a good stir to cover it in the liquid. Allow your tofu feta to sit in the fridge for at least an hour to let the tofu soak up the flavors. What type of tofu should I use for the vegan feta? Make sure that you use the firm refrigerated tofu. The soft tofu or the silken tofu that comes in little cardboard boxes it too soft and will fall apart. The high protein tofu that is really dense and comes vacuumed sealed is too firm and doesn’t’ give the soft texture that emulates real feta. Should I add herbs to my vegan feta? Herbs add a nice flavor to this feta. I like to add about 1 tsp of dry herbs like oregano or Italian herbs mix. However, classic feta doesn’t have herbs and it just a salty cheese with a slight bite. So if you want it to have a more classic taste, leave the herbs out. I like the herbs in the Greek pasta salad, but I leave them out when I make my beetroot salad because those flavors would clash with the fresh mint. My kids love it plain right out of the container. (They actually kept eating it before it was done and I could do the photo shoot so I ended up making it 3 times before I finally got fending them off to take the pictures). 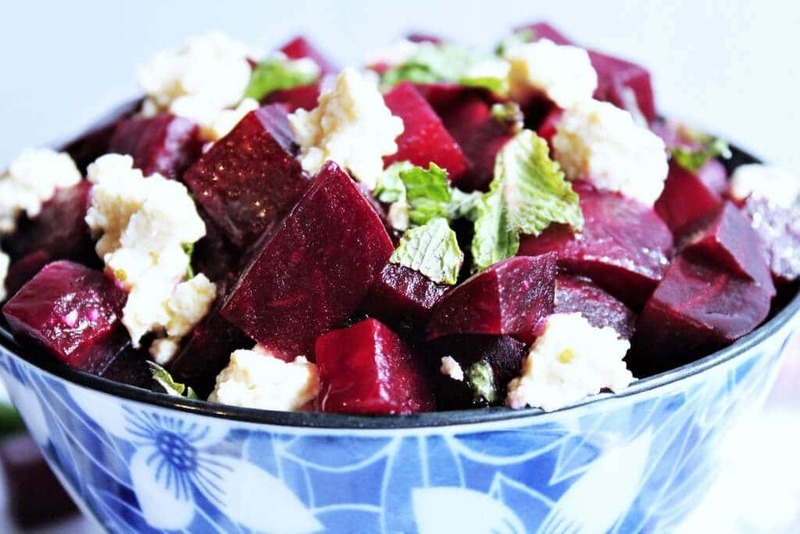 I love it added to beets, pasta, or chickpea salads, but you can use it any way that you would use feta or you can just eat it out of the bowl like my kids! Did you make this tofu feta? Leave a comment, I would love to hear what you think! A recipe for homemade vegan feta cheese made from tofu. Press a block of firm tofu to extract as much water as possible. Combine all the ingredients except for the tofu in a shallow dish and stir until well mixed. Crumble the tofu with your hands into small bite-sized pieces and add to the marinade. Stir well to coat the tofu in the marinade and place in the fridge for at least 1 hour. Use as you would feta cheese. Let the tofu marinate for at least an hour to soak up the flavor. Keep the vegan feta in the fridge in a sealed container for up to 3 days. For a tangier feta double the apple cider vinegar and lemon juice. Wow! This was delicious! I’ve been missing feta for so long! This satisfied that craving! I’m so happy to hear this Erin! Enjoy!